Kenny Tree Inc. Provides 24 Hour, 7 Days a Week, 365 Days a Year Emergency Service. In the event of a storm and you experience a tree hazard, KTI is the premiere company for just this emergency. 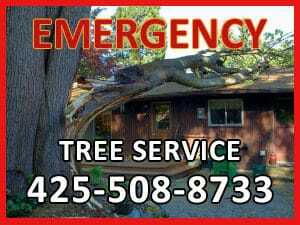 With over 21 YEARS providing emergency tree service, KTI has the resources and experience to help meet all of your needs. If you have a tree on your car or structure, you can be rest assured that we have the experience and specialized equipment to clear these trees. Storms and weather damage are almost a certainty at some point if you live in the Great Northwest. Through the last decade the storms have been memorable and have caused significant storm damage with hazardous trees falling and creating significant damage. Trees that are damaged, diseased, decayed or dying already are more prone to fall during these extreme conditions. That is why you should take precautionary action, with potential hazardous trees to have them evaluated and removed prior to the storms. In any event KTI is here to serve you and provide unequalled, best in class service to help you recover from a storm. Please see our Photo Gallery to view some of our emergency work in action.